Viva Blackpool is an award-winning multi-purpose venue based next to Blackpool Tower. Since 2012 it has been host to events such as weddings, private parties, and one-off specials, and has become a central part of Blackpool’s vibrant entertainment scene. Viva Blackpool's website had, over time, become congested, and this had led to a confusing user experience. The abundance of on-site data made choices for visitors overwhelming and it was frustrated as sales weren't being maximised. Consequently, the company was looking to simplify its design in order to merchandise its service better and, ultimately, drive more sales through desktop, tablet, and mobile devices. The new website needed to integrate with their back office and digital ticketing system – Spektrix. With this in mind, we realised a redevelopment with a bespoke API which was required – this would need to syncronise the data from their onsite EPOS system to update the website with ticket availability, shows prices, and information, as well as allowing Viva to prioritise and merchandise based on their business requirements. 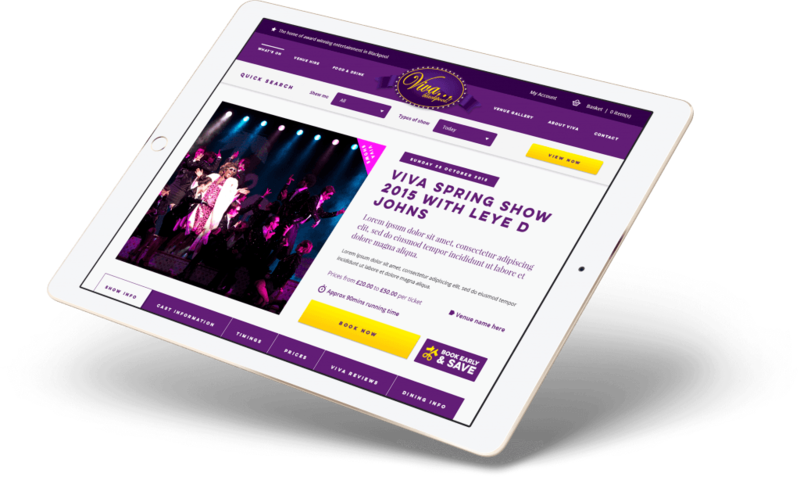 Viva Blackpool caters for multiple types of customers, such as those wanting to book entertainment (making our theatre web design skills particularly useful) and families planning a function event. In the entertainment and leisure sectors, mobile and tablet traffic now outnumbers traditional desktop. This made a mobile-friendly approach vital for the user interface and it’s now a central aspect to our travel and leisure marketing services. As a result, we focused on creating clear, visually rich, but easy to interact with elements to ensure the bounce rate was kept to a minimum. Additionally, the checkout funnel time has also been drastically reduced. We organised information for mobile around the buying experience, placing key data in a clear hierarchy from the landing page, to search, and finally through to the checkout. This streamlined delivery has increased mobile conversions by over 330%. Spektrix is the market leader in the event booking sector and provides Viva with a point of sale solution and CRM for managing all aspects of their business. As a consequence, it was crucial to synchronise data to eliminate any need to re-enter information in the CMS. To enable this we developed a bespoke Spektrix WordPress plugin – this now auto-synchronises all of their show information and availability, in real-time, with the website. • Real-time synchronisation between Spektrix and WordPress. • Dynamic search filtering and categorisation features. • Fully integrated marketing strategy across paid search linked to user • Merchandising features driven to promote key shows. In tandem with Viva's offline merchandising, we integrated promotional features to easily allow them to drive time sensitive promotions, headline shows, and offer driven purchases, to maximise transactions and increase overall basket value. Take a look at what Martin has to say about us.